Getting Compensation When You're Injured on the Job | Merkel & Cocke, P.A. Things aren’t easy for most Americans lately, and many folks don’t have a lot of wiggle room with their budgets. When you suffer an injury on the job, missing work and dealing with medical bills can throw a devastating wrench into your finances. Fortunately, Mississippi workers’ compensation law provides those injured on the job with coverage for medical bills and lost time at work. This seems straightforward, but in reality, many employers and their insurance companies may try to do whatever they can to reduce the amount of money they have to pay out. They may do this by attempting to minimize your injury by claiming it isn’t actually work-related, demanding you return to work too soon, or implying you received an unreasonable amount of treatment. Your employer should stand by you when you’re hurt on the job, and you deserve workers’ compensation for your injuries. The first thing to remember is that Mississippi has a no-fault workers’ compensation system. 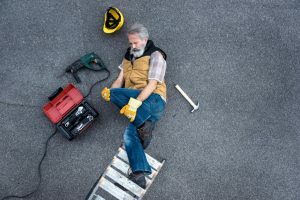 You don’t need to show that your employer acted negligently to receive benefits—as long as your injury happened on the job or was caused by work activities, you should be covered. If you’re hurt on the job, the first thing you should do, of course, is get medical treatment. Next, you need to report that injury to your employer. You have 30 days to report an injury (or the discovery of an injury), but it’s always best as a practical matter to report that injury as soon as possible, and to do it in writing. Your employer will then file a claim with its insurance company. When the claim proceeds as it should, you’ll receive medical care from a doctor, who will identify the injury and determine a course of treatment. If you need time off to recover from your injuries, you’ll receive temporary disability benefits, which are two-thirds of your average weekly wage, until you’re able to return to work. The physician (who is typically chosen by the employer) determines that you don’t have a significant injury, despite the fact that you’re in serious pain. Even though you’re clearly injured, your employer determines you weren’t injured on the job. For example, your employer may suggest your back injury took place at home but you reported it as a work injury. The doctor determines you’ve recovered after a period of treatment and can return to work, even though you are still in pain and unable to work. In situations like these, it’s in your best interest to contact a workers’ compensation attorney. Other types of workers’ compensation available in addition to temporary disability benefits include permanent total disability, permanent partial disability, and death benefits. If you believe you are being wrongfully denied workers’ compensation benefits, contact the legal team at Merkel & Cocke for assistance. You should not have to deal with medical bills and loss of wages on your own. Please call us today at 662-799-1633 or complete our contact form to schedule a free consultation.